$70K for "friendship, $40K for applying to the CIA, how much was he paid for applying to the US Foreign Service? Cover of No Way OutAmazing how much the Chinese would pay for something called "friendship." Applying to the CIA? $40K. Thank goodness he did not get through the door, but if he were able to penetrate the hiring shield of the US Foreign Service, his handlers would have gotten bored listening to his 2-4 year escapades in consular sections talking to visa applicants, or destitute Americans overseas. 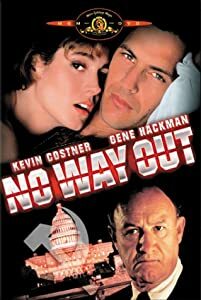 Of course, we all remember that the Russkies waited more than that in No Way Out, yeah? WASHINGTON—Glenn Duffie Shriver, 28, of Detroit, Mich., pleaded guilty today before U.S. District Court Judge Liam O’Grady to conspiring to provide national defense information to intelligence officers of the People’s Republic of China (PRC). Shriver pleaded guilty to a one-count criminal information charging him with conspiracy to communicate national defense information to a person not entitled to receive it. In a plea agreement, the defense and government jointly recommended a prison sentence of 48 months. Sentencing is scheduled for Jan. 21, 2011. According to a statement of facts filed with his plea agreement, Shriver is proficient in Mandarin Chinese and lived in the PRC both as an undergraduate student and after graduation. While living in Shanghai in October 2004, Shriver developed a relationship with three individuals whom he came to learn were PRC intelligence officers. At the request of these foreign agents, Shriver agreed to return to the United States and apply for positions in U.S. intelligence agencies or law enforcement organizations. Shriver admitted in court that he knew that his ultimate objective was to obtain a position with a federal department or agency that would afford him access to classified national defense information, which he would then transmit to the PRC officers in return for cash payments. In December 2009, Shriver received notice that he was to report to Washington, D.C., in May 2010 for final employment processing activities with the CIA. Shriver admitted that he communicated with a PRC intelligence officer that he was “making some progress” in obtaining a position with the CIA and that he would not be free to travel to PRC for another meeting because it could raise suspicion with federal agents conducting his background investigation. Shriver admitted that he made false statements on the CIA questionnaire required for employment stating that he had not had any contact with a foreign government or its representative during the last seven years, when in fact he had met in person with one or more of the officers approximately 20 times since 2004. He also deliberately omitted his travel to PRC in 2007 when he received a $40,000 cash payment from the PRC for applying to the CIA. In addition, Shriver made false statements during a series of final screening interviews at the CIA, and he admitted he made each of the false statements to conceal his illicit relationship with the PRC intelligence officers. Active links added above. Read the whole thing here. Added to original post: AP reported that Shriver took the Foreign Service exam in 2005 and 2006. He failed both times, but his Chinese handlers gave him $10,000 for his first attempt and $20,000 for his second. Wait -- he got $30K for flunking two exams? Sounds like a bad bargain. And here I thought the Chinese were great at bargaining. But it does make you wonder what they would have given him had he made it through the entry process - his own Gulfstream?